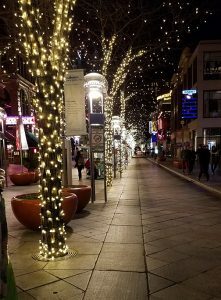 Denver, Colorado - Fun Facts and Unique Qualities of the Mile Hi City! Fun Filled Facts about Denver! 2. The first permanent structure in Denver was not a hospital, bank or house—it was a saloon. 3. Denver brews more beer than any other city in the nation, with over 200 different beers brewed daily. 4. In Denver’s rarified air, golf balls go about 10% farther than they would at sea level. 5. Because of Denver’s air and altitude, it’s also easier to get drunk. Alcoholic drinks can sometimes feel 1.5 to 3 times more potent in the Mile High City. This is said to be due to the lower oxygen levels in the blood. 6. The 1976 Winter Olympics were originally going to be held in Denver. However, after the community voted against it, the city withdrew their bid, making it the first place to ever turn down hosting the Olympics. 7. Famed music group Led Zeppelin played their first show in America at the Denver Auditorium Arena on December 26, 1968. 8. In 1902, the police at Denver Union Station started enforcing a “no kissing” rule on platforms because it slowed down the trains. 9. William McGaa, one of the first settlers of Denver, named several downtown streets, one of which was called Wewatta for his original Sioux wife. However, he also named another street, Wazee, after his mistress. Talk about awkward. 10. Denver is one of the 12 US cities to have teams from four major sports (baseball, hockey, football and basketball). 11. The National Western Stock Show, held in Denver, is the largest stock show in the world. The National Western Rodeo is also one of the biggest rodeos on earth. 12. Denver has been named the “Baby Boomer Capital of America,” boasting a higher number of baby boomers than any other US city. 13. The dome of the Colorado state capitol is plated with real 24K gold. 14. However, the real rarity of the Colorado state capitol is on the inside because the building’s interior has large amounts of Colorado Rose Onyx. The world’s entire known supply of the material was used on the building. 15. Denver was rated as the healthiest city in the country for pets by Purina, ranking high in categories like veterinarian to pet ratio and low number of fleas. 16. Denver has the largest city park system in the nation, with 14,000 acres of mountain parks and 2,500 acres of natural areas. 17. Denver collects more money for the arts per capita than any other US city. 18. Except for Calvin Coolidge, every US President since Teddy Roosevelt has visited Denver’s Brown Palace Hotel and Spa. 19. Denver’s nicknamed the Mile High City because it sits at an elevation of exactly one mile, or 5280 feet. 20. Denver has the 10th largest downtown in America. 22. Denver is ranked among the best cities for singles in the nation. 23. Denver currently has more marijuana dispensaries than Starbucks stores. 25. When viewed from above, the 400,000 pieces of granite paving on the pedestrian walkway of the 16th Street Mall resemble the skin of a western diamondback rattlesnake. 26. 200 named peaks are visible from Denver. 32 of them tower at 13,000 feet and above. 27. Elvis Presley once flew in his private jet from Memphis to Denver’s Stapleton Airport just for a sandwich. He ordered 22 Fool’s Gold Loafs, a sandwich containing a jar of peanut butter, a jar of grape jelly and one pound of bacon, from the Colorado Gold Mine Company Steakhouse for him and his friends. They dined on the sandwiches with champagne and then returned home. 28. The population in Denver has more than doubled since 1960. 29. In Denver’s old west days, the city had a performance of Shakespeare’s “Macbeth” before it had a school or hospital. 30. Denver was home to the very first Chipotle Mexican Grill. 31. Denver was named after Kansas Territorial Governor James Denver in hopes of gaining political favor. However, by the time the town was named, Governor Denver had retired. 32. But it wasn’t difficult to convince others to name the city after the political leader. The alternative names for Denver were dropped for a shared barrel of whiskey. 33. During the Denver Broncos’ AFL years, they had the worst record of any AFL team. However, they were also the first AFL team to beat an NFL team. 34. Denver is one of the few cities in the country that wasn’t built on a road, railroad, lake or navigable body of water. Settlers were attracted to the spot because of the gold found there. 35. Denver is one of the sunniest cities in the US, with 300 annual days with some sunshine each year. 36. The Denver Performing Art Complex is the 2nd largest performing arts center in the world. 37. According to USA Today, Denver is one of America’s top 10 “thinnest” cities. The ranking is based on the high percentage of fit people in the city! 38. The original founder of Denver’s oldest restaurant, the Buckhorn Exchange, met Buffalo Bill when he was 10 years old and, within two years, was riding with both Buffalo Bill and the great Indian Chief, Sitting Bull. The later even gave him the nickname, “Shorty Scout,” because of his small stature. 39. At just over 26 miles long, Colfax Avenue is the longest continuous street in America. 40. Colorado Rockies’ Coors Field is one of the best ballparks in the nation for home runs. Because of its high elevation and the dry air, the balls fly much farther when hit than in other stadiums. The field has twice broken the record for major league home runs hit in a single ballpark in one season. 41. Denver is home to the Great American Beer Festival, the American brewing industry’s top beer tasting opportunity and competition. 42. There are also more than a dozen wineries in the Denver metro area. 43. Although today Denver is the largest city and the capital of Colorado, the city’s first settlement, Montana City, was quickly abandoned. Minors favored Auraria, a more prosperous gold-mining settlement a few miles away. 44. The Denver mint is the single largest producer of coins in the world. You can tell if a coin is made in Denver by a D mark. 45. In Denver, it is unlawful to lend your vacuum cleaner to your neighbor. 46. Contrary to popular belief, Denver is not in the Rocky Mountains. Instead, it’s near them, lying at the base of the mountain range. In fact, it was built on the high planes and is one of the flattest cities in America. 47. Bob Dylan lived at 1336 East 17th Ave. in Denver for a short amount of time in the 60s, while doing a series of gigs at the Satire Lounge. 48. Denver’s bright blue sky really is bluer than many other cities’. Because of Denver’s elevation, the air has less water vapor than it would at a lower altitude, making for a gorgeous sky and perfect sunsets! 49. Denver International Airport is the largest airport in the country in terms of land area. It’s so huge that the four busiest airports in the US (Hartsfield-Jackson Atlanta International Airport, O’Hare International Airport, Los Angeles International Airport and Dallas/Fort Worth International Airport) could fit into Denver Airport’s 53-square miles of land. 50. There were originally three different towns with three different names where Denver stands today. Denver and the entire Front Range is a wonderful place to call home! Call me today with questions about relocating to our wonderful city!